In pain? Tape your muscles for faster recovery! Sounds ridiculous right? Actually it’s not as crazy as you think. Read on to see why. As a matter of fact, I am wearing the tape right now! If you are not sure what tape I am referring to, you may remember seeing the Olympic athletes wearing this brightly colored tape on various parts of their bodies in the past Olympic games. Was this a new fashion trend in the athletic world or was this for something more meaningful? 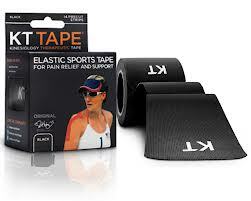 In fact it known as kinesiology tape and it has been around since the late 70’s. Although first used only by medical professionals it can be easily applied by yourself now. Its claims include helping heal certain injuries and providing greater muscle endurance during competitions and races. How can taping your muscle possibly help heal an injury? By applying this stretchy tape over the affected muscle, it actually lifts the dermis or skin away from the muscle which allows for more blood and lymph fluid flow. This circulation of fluids promotes healing. Also, there is less compression of the nerves around the injury which lessens hypersensitivity and also aids in the healing process. The tape also provides support and allows for more pain free movement while recovering from an injury. This added stability and support also makes it a great aid in endurance races. Among the long list of injuries and conditions this tape can be used on are tennis elbow, rotator cuff, Achilles tendon, ankle sprains and plantar fasciitis. I am currently using it for my battle with plantar fasciitis. For this condition I have tried arch inserts in my shoes, icing my feet, rolling a tennis ball on my feet and even wearing that hideous boot at night to increase the stretch in my arch. I have also tried cortisone shots. Now the cortisone shots really worked but the relief is temporary and not a long term solution as it can actually weaken the area if overused. I have been wearing the tape on and off for about a month now, and I can really tell a difference. I have had a lot less pain while remaining active. Some say this is a placebo, but in my case I don;t think this is the case. 1.There are 3 main brands out there. I tried the KT tape and it really relieved my pain, but it did not stick well. 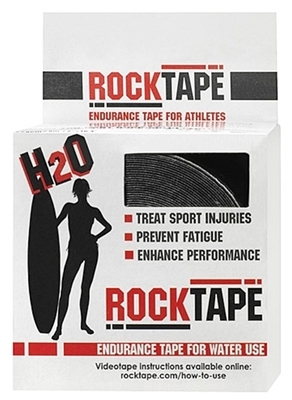 I am currently trying Rock tape which seems to be sticking a lot better. Kinesio tape is another brand, but I have not tried that one. 2. Follow the directions! Where you place the tape is crucial for success and don’t forget to rub the tape a lot once it is placed. The heat created is what makes it stick longer. Remember also not to allow any stretch at the beginning or end of the pieces (known as anchor points) to hellp ti stay in place longer. 3. 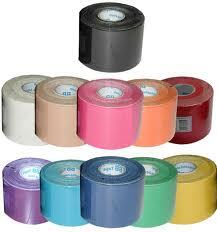 Depending on how much tape your injury requires one roll can last a month or two. The rolls are between $12 and $18. They do come in a lot of different colors and patterns too! In my opinion taping is worth a shot if you are dealing with chronic pain from overuse or injury.Of course you also need to know when to give your body a complete rest for awhile, but in the right situations I think Kinesio tape is a great way to stay active during recovery. Have you tried Kinesio tape and had success or maybe not? Please let the readers know your story! « Diet or exercise? Which is REALLY better for weight loss?